Does Citi still think money doesn’t matter? Citibank’s long-running “Live richly” ad campaign is all warm and fuzzy and mushy, and basically says money doesn’t matter all that much, compared with love and happiness and all that crap. Well, it starts to matter a whole lot more when you can’t get any of it out of the damn ATM. According to Boing Boing, some sort of major fraud crisis has locked many U.S. Citibank customers out of their accounts. (It seems to be affecting customers traveling in Canada, Russia and the U.K.) Consumerist is following the story too, and is none too impressed with the bank’s response to the situation. 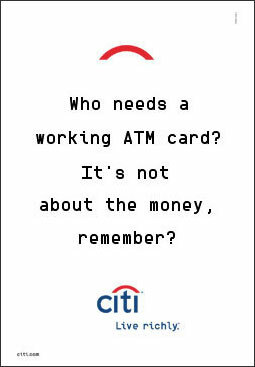 We thought we’d add our own thoughtful and measured criticism, in the form of the imaginary Citibank ad here, courtesy of Photoshop. Really, though, this ad campaign was asking for it. UPDATE: The ever-wily Consumerist has gotten some more dirt by calling Citibank and posing as a concerned customer. UPDATE NO. 2: To clear up any confusion, this is a fake ad. I made it myself in Photoshop. The Citibank font is a variation on OCRK Bold Square. To make your own Citibank spoof (if you’re so inclined), visit the OCRK Bold Square page on MyFonts.com, and whip up any sample text you like. A few screen captures and Photoshop shenanigans later, you’ve got your ad.